In fact, it is surprising how undervalued creativity is in peace-making and peace-building. True, some peace-building NGOs and United Nations agencies have conflict and culture/art programmes that use art to raise awareness, stimulate debate, or change attitudes in target communities. However, none of the peace-making non-profit, governmental, or multilateral organisations I know have any built-in mechanisms to bolster institutional or staff creativity. Perhaps part of the reason for the undervaluation of creativity in the field is to be found in how peace-making and peace-building is currently taught. Among the many universities that now offer degrees in conflict resolution and the like, there is a heavy focus on theory, practice and methodology. Very few have dedicated courses on creativity in peace, and there is not much collaboration between these universities and arts institutions. Among the for-profits, as far as I can see, only my own International Conflict and Security Consulting Group (Malta, United Kingdom, Nigeria, and Hong Kong), and our buddies at Integrity Research and Consultancy (United Kingdom) are actively nurturing institutional creativity by joining with others to help set up Artraker and apply emerging insights to how we do business. Artraker itself helps shape through art how individuals and organisations understand and respond to violent conflict. It is a network that connects conflict artists with peacemakers to generate innovation and co-create new approaches to instigate peace. The idea that art can foster creativity in peace-making is gaining traction, with Norwegian former Minister, peace-maker, and current Chair of theOECD/DAC, Erik Solheim recently joining the Advisory Board for Artraker’s Positive Peace Project. We’ve been involved in Artraker since its start in 2012 and have learnt a lot about how art can help make better peace and how to keep ourselves creative. These add up to 10 ways in which creativity can work for peace and a couple of important benefits for peace-making organisations. 1. Art is a catalyst for change We are now increasingly aware of the ways in which art interventions can shift the dynamics of violence. 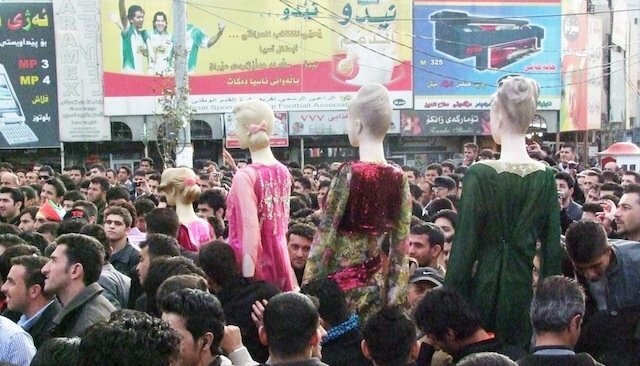 Rozhgar Mustafa’s Five Plastic Women Protesters, featured in the photograph above, is an example where art was used to reduce tension and open the space for more inclusive dialogue in Sulaimani (Iraq). I call this ‘tactical conflict art’ and there’s a lot of it. It is a great source of inspiration when thinking about ways to reduce levels of violence in a specific locality. There is also ‘strategic conflict art’, which works at changing deeply held prejudice and attitudes, often through theatre, radio, television and film – as exemplified by the excellent work of US-based Search for Common Ground and their radio-based soap operas. 2. Art heals Perhaps the most well known application of art in war-affected areas, art therapy is used to help traumatised adults and children recover or come to terms with their experiences. Less known, perhaps, are initiatives that help refugees and other displaced to begin the also important process of recovering their sense of family, community, and identity. Interventions such as Alexia Webster’s Street Studio Project are simple; a street photography studio with a photo-printer is set up in a refugee camp, and families are given the opportunity to take and take home family portraits. A simple and powerful way to help those in places of uncertainty and transience regain a sense of identity and belonging where it is needed most. 3. Art provides alternative narratives Much of our time as peacemakers is spent countering or working around dominant narratives created to justify the actions of one party or another. This battle of narratives is played out in the media and involves scripted sound bites and selective imagery. Art can provide a rich source of alternative and subjective narratives, as well as counter-narratives or narratives that unify, rather than divide. Two of my favourite examples are from Afghanistan and Mali. 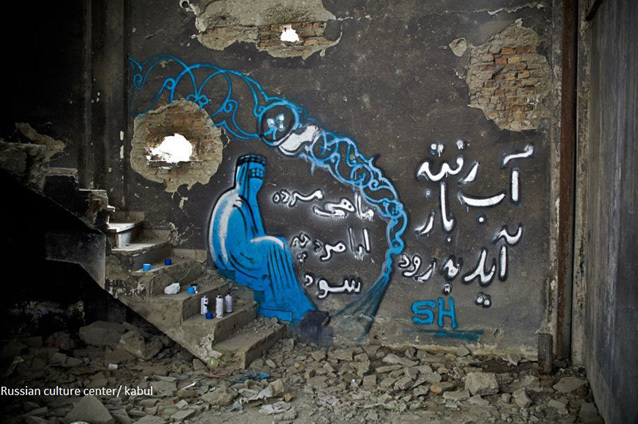 Assadullah Baran Bromand’s Lie of Freedom, is a set of installations using burqas and turbans in buildings destroyed by shelling, which seeks to counter misconceptions around Islam, democracy, freedom, and human rights. Bakari Diallo’s TOMO, a short film, provides a powerful alternative narrative of the impact of war in Mali on often forgotten rural areas. 4. Art informs and enhances the use of space Most peacemakers know that you have to set up the physical space for dialogue in a way that is conducive to opening minds to solutions and opportunity. But beyond this, ‘space’ is a broad area where art, design, and architecture intersect with how we make and keep peace. For example, architecture and urban planning in cities can support inclusion and counter a sense of marginalisation. Similarly, the way a refugee camp is designed can foster safety and promote coexistence in camp populations. A great example of working with space to change perspectives is Shamsia Hassani’s (referred to in the media as Afghanistan’s Banksy) graffiti and 3D street art in Kabul, which in her words aims to “take off the bad memories of war”. 5. Art can awaken imagination in leadership The inability or unwillingness of leaders to imagine an alternative peaceful future often perpetuates violence and conflict. In fact, dealing with unimaginative and narrow-minded political leaders is one of the most frustrating parts of a peacemaker’s job. Is it possible through art to awaken the imagination of the unimaginative or to help leaders imagine new possibilities? There’s no definitive answer to these questions yet and the statement that art can awaken imagination in leadership remains a hypothesis; but one that will be tackled (and hopefully proven or disproven) by the Artraker Positive Peace Project. 6. Engage with conflict art Often it is the simple stuff that works. We bring our Associates and Managing Partners together (along with our clients) to the Biennial Artraker Awards and Exhibition, where shortlisted conflict artists are showcased. There are also on-going conflict art exhibitions, such as those shown by Art Represent in London or talks organised by Culture + Conflict. Beyond Europe, there’s the Artraker Art of Peace Exhibition, which brings 2013 and 2014 shortlisted works to Sri Lanka and Myanmar, with other stops planned in 2015 and 2016. We do other things too; facilitate jury deliberations for the Artraker Awards, deploy our partners to join the Artraker jury, and co-fund the Artraker Art of Peace Exhibition. 7. Bring conflict artists into projects and the institution We tend to enjoy having our assumptions questioned and like being shown different and unconventional ways of seeing things. Therefore, we are making a habit of including conflict artists as part of our project advisory boards and project teams to keep us asking the right questions and looking at things from different angles. If we were set up with big in-house teams (which we are not), we would follow the practice of some development organisations and have an artist in residence. This basically involves a one or two-month residency for a conflict artist where he/she interacts with staff, participates in meetings, and generates art and ideas. 8. Co-create with artists This is the approach taken in the Artraker Positive Peace Project; conflict artists and practitioners co-develop an art intervention, which they subsequently co-create and implement. It is a process with an important transformational impact. However, it can be done in simpler ways. For example, by involving staff in a creative process of sorts with an artist; a day a week or month, as part of an effort to stimulate creativity. 9. Participate in art interventions During the last Artraker Awards, I participated in Lorena Wolffer’s States of Exception. 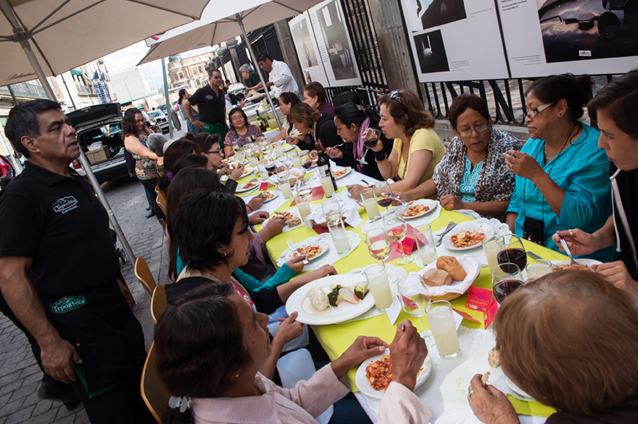 It’s an intervention that was conceived “in response to the growing wave of violence against women in Mexico that forces us to live in a de facto state of exception”. It involves a meal (in this case, tea and cake) for 20 female passers-by in a public space, where experiences of violence are shared. My role in this intervention was only to serve tea, but even this marginal role gave me a number of new insights into new ways of facilitating recovery from violence and war. 10. Partner with dedicated conflict art organisations We are great believers in collaboration and partnership as an integral way of doing business. Partnership with Artraker provides us with a continuous feed of creative input and opportunities to build a creative culture within our business. For us and the other members of the Artraker network, institutionalising the relationship is key to firmly entrenching and sustaining a creative organisational culture. And the benefits of using art to make better peace and strengthening institutional creativity? For us there are two obvious ones. First, we are continuously expanding our toolbox with new ways of affecting change, fostering healing and recovery from war and violence, countering dominant narratives that perpetuate violence, using space to facilitate peace-making, and supporting inspired political leadership. And second, the more creative our organisations become, the better we are at finding innovative ways of addressing the evolving challenges we face in peace-making. It keeps the minds of our experts open and nimble enough to create new effective ways to reach desired outcomes. So what’s the photograph? It is a picture of Rozhgar Mustafa’s Five Plastic Women Protesters art intervention in Sulaimani (Iraq) reproduced with the kind permission of Artraker. If you want to learn more about it, our work, or indeed how we stay creative in our work, just get in touch.